Lynda Sekora knew she was losing some of her vision, but the night she realized she couldn’t read her insulin pump anymore, the Orland resident sank into a deep depression. Due to a lifetime of Type 1 diabetes, Lynda was blind in one eye and had macular degeneration and glaucoma in the other. As her husband, Palmer, watched her sink further and further into anxiety and depression throughout 2012, he knew something had to be done. Lynda’s ophthalmologist in Chico did not know any place that could provide resources, so Palmer began digging through the phone book and newspapers. He wanted to do anything to help Lynda feel better – she had always been such an independent person. But he kept hitting dead ends. Meanwhile, Lynda began seeing a therapist and taking anxiety medication, but nothing was helping her realize that life could go on. Then Palmer came across Society for the Blind, and one of the instructors came to their house to visit with them. They described her as a “big ray of sunshine.” She told them about Society for the Blind’s Senior IMPACT Project that starts with a weeklong retreat. 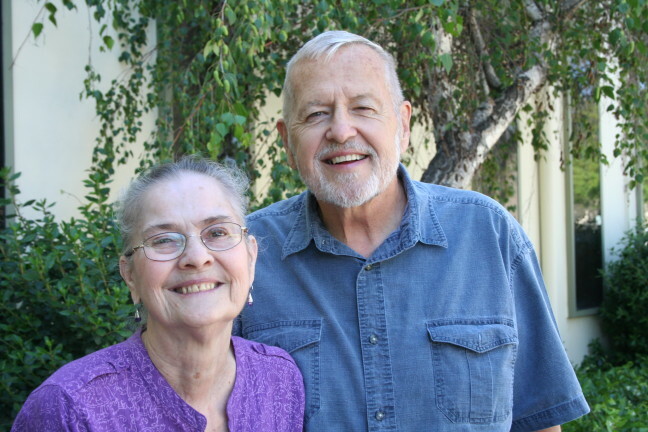 Though the retreat is geared toward the person losing vision, Palmer decided to participate alongside his wife so he would understand her experience. During the training, Lynda and Palmer learned to cook using real knives and a real stove. They learned how to navigate streets using a white cane, shop and know which bills they were using, thread a needle, read braille and use talking gadgets like a labeler. After the retreat, Lynda’s depression lifted. Her counselor was so impressed that she decided Lynda didn’t need her anymore. She also began weaning off the anxiety medication. Three years later, Lynda is proud that she can cook, tend her house, go out to dinner, go on trips and have lunch with her friends. Palmer manages her insulin pump, but Lynda makes all of the decisions regarding her care. They credit this transformation to the retreat at Society for the Blind. Since the retreat, Lynda and Palmer have attended a few of Society for the Blind’s workshops for seniors including yoga, exercise and self-defense. Because of their own experience searching desperately to find help, the Sekoras now volunteer at expos around the Sacramento area, distributing information and talking about Society for the Blind so that others will never have to experience the same isolation.